2) The vanity - The vintage look of the weather-worn dresser with antique cup pulls, and all as a vanity?? Crazy good. 3) The mirror - I admittedly have a thing for simple mirrors with metal edges, and I love that this one is rectangular but with rounded corners. 4) The wall-mount faucet - The perfect mix of old and new...the faucet itself looks vintage but the way it's been mounted from a white stone (marble??) backslash is so modern and cool. 5) The tile - The white classic subway tiles with dark grout in the shower, check!! Dark slate subway tiles on the floor, check check! 6) The herringbone rug - I don't think I will ever tire of a classic herringbone pattern, especially in black and cream. 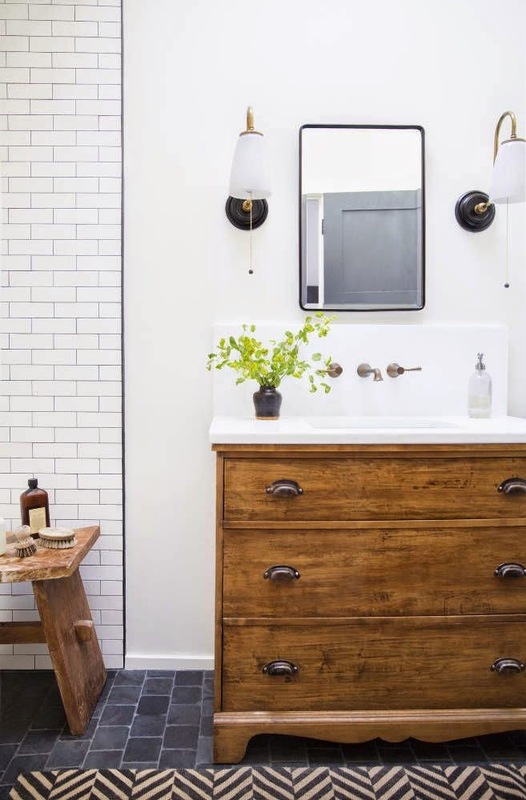 7) The stool - nothing adds texture to a simple neutral bath more than a well-placed vintage wood stool. The patina adds such authenticity to the design. What about you...do you like this bathroom as much as I do? What are your favorite features? If you think the bathroom looks good, you should see the kitchen before & after. It will make you want a full house tour. Lauren has mad skills!